Due to the fact that blackjack is one of the most widespread casino games, it’s no wonder that there are various ways to enjoy it. In order to attract more players and to make the game even more enticing, nowadays most casinos offer the classic game along with some of its exciting variations. Thanks to this huge diversity, it is possible to experience blackjack like never before as every variation has its special features and rules. Players of all types have the opportunity to try a number of versions and this way diversify their gaming experience significantly. Some blackjack versions have gained in popularity so much that they are almost as famous as the original game. All of the blackjack variations have the same basic rules, meaning that the main objective to reach 21 or to form a total as close as possible to this number, remains. It is fairly easy to distinguish any of the versions straight away since all of them have unique features and subtleties. Some games have been especially created to be more different and challenging, whereas others have been simplified in order to be suitable for novice players. There are a few variations which even alter the way the dealer’s cards are positioned. It is also possible to play a version which is almost identical to the classic game as the only difference in it is that it features additional side bets. Before trying a particular game, it is essential to get familiar with all of its rules and subtleties in order to be prepared for the possible situations that might occur. Since all of the variations have unique rules, their house edge is different. It should be noted that it can differ from one casino to another which is the reason why players should always take their time to consider it beforehand. Let’s have a look at some of the most played variations of blackjack and their house edge in order to determine whether they work in favor of the casino. Prior to playing, it is recommended to consider this aspect in order to get a general idea of the game. The house edge plays a crucial role as it determines players’ chances of winning to a huge extent. Atlantic City Blackjack is very similar to the classic game of blackjack which makes it perfect for more traditional players. What tells apart this version from the original game is the fact that it is played with eight decks of cards, instead of six. It is possible to enjoy either a single or a multi-hand version which have the same basic rules. Even though the number of packs is increased, this variation has a very low house edge – 0.35%. It is a Hole card game, meaning that the dealer peeks for blackjack. He is also enforced by the rules to stand on soft seventeen. In this game, it is allowed to double down on any two cards and split a maximum of three times. Late surrender is another move that players can make during the game, meaning that it is possible to give up their hand after the dealer has peeked for blackjack. European Blackjack is another very widespread version of the game that can be played in most brick and mortar casinos as well as online. Initially, it was a game played predominantly in Europe, but it became so popular that nowadays it can be found in various casinos all over the world. It is one of the few versions that use only two standard decks of cards. Its house edge is 0.39% and if players apply a basic strategy, they have fairly good chances of winning. It is not a Hole card game, meaning that the dealer doesn’t peek for blackjack. The dealer is enforced by the rules to stand on soft seventeen and if he goes over twenty one, the result is busting. If both the player and the dealer have blackjack, the result is a Push. It is possible to split a pair only once and the two cards that compose it must have the same rank. For instance, it is possible to split two Queens, however if players have a Ten and a Queen, they cannot take advantage of this move. The rules of the game can differ from one casino to another and therefore it is always a good idea to double check them in advance. Vegas Downtown Blackjack is an exciting version of blackjack whose name comes from the fact that it was predominantly played in the brick and mortar casinos in Last Vegas. It uses only two packs of cards which makes it very beneficial for card counters. The dealer hits on soft seventeen but stands on hard seventeen. He peeks for blackjack, providing that his up card is an Ace or a 10-valued one. Players are allowed to double down on any two cards and it is also possible to do so after splitting. They can resplit a pair and form up to three hands. The house edge of this variation is 0.38% which is considered to be a very beneficial one. In this version, blackjack usually pays 3/2, however the payout for this winning combination can vary, depending on the casino. 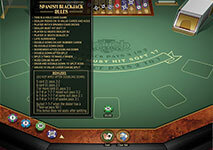 Spanish Blackjack or also commonly known as Spanish 21, is considered to be one of the most challenging variations. It has a very distinguishable rules and one of the major differences between this version and the classic game, is that all of ten cards are removed from each deck. It is played with six or eight decks of cards, each one consisting of 48 cards. Even though at first glance, this rule highly favors the casinos, the house edge of this version is fairly low – 0.38%. One specific rule that is beneficial for players is that whenever they have a hand whose total is 21, they automatically win, regardless of the cards the dealer has. In this version, it is possible to double down after splitting on any two cards, including a pair of Aces. It is also allowed to surrender, even after doubling down. This variation offers different payouts, depending on the particular winning combination. For instance, if players have a total of 21 that consists of five, seven or more cards, the payout is 3/2. In case that they have a total of 21 that consists of 6 cards, the payout is 2/1. 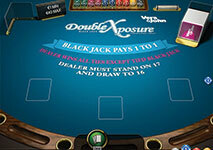 Double Exposure Blackjack is a very interesting variation which offers players the chance to experience their favorite game in a very different way. What sets this version apart from the rest of the blackjack games, is the fact that initially, the dealer is dealt two cards, both of which are visible to all of the participants. Even though this adjustment works in favor of the players, there are some additional rules which are not as beneficial. For instance, in this version the dealer wins instantly all ties, except for the cases when players have a natural blackjack. Furthermore, blackjack pays out even money just like the rest of the winning combinations, instead of the standard 3/2 payout. It is possible to split a pair only once which is also highly unfavorable for players. 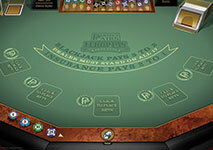 The house edge of this version is also moderately high in comparison to other blackjack games – 0.69%. The rest of the basic rules for this version differ from one casino to other which is the reason why they should be considered beforehand. Another well-known variation of blackjack that is played in a number of casinos is Perfect Pairs. It is the same as the classic game, however with the difference that it offers a side bet. This new feature is one of the main things that make the game so attractive as it gives players the chance to win big by placing an additional wager. However, it is worth mentioning that the odds of this side bet are not always in favor of the players and therefore, they should proceed with caution. 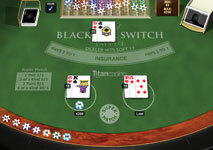 Blackjack Switch is undoubtedly one of the most outstanding versions as its rules and gameplay are quite different from the classic game. What makes this game so unique is the fact that players have two hands to play with instead of the usual one, and that they have the chance to exchange cards between them. This way they can form winning combinations much easier since the chances of getting a particular card are higher. This variation has one of the lowest house edges among all games – only 0.17% due to the aforementioned rule. Even though players can switch cards from one hand to another, it should be noted that these two hands are separate and they should be played as such. In this version, all players receive their first two cards face up and they can choose to switch the top cards or hold them instead. Some casinos offer Multi-Hand Blackjack Switch, meaning that players have the chance to play with up to five hands. 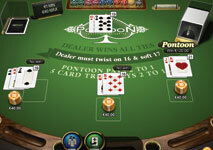 Pontoon is an exciting version of blackjack that highly resembles another variation – Spanish 21. In most casinos this game is played with either six or eight decks, however this number can vary, depending on the casino. The main objective of the game and the assigned values of the cards are the same as in the classic blackjack. In this variation, players have to decide who is going to take the role of the banker. At the beginning of the game, all of the gamblers have to place their bets, without being able to see one of their cards since it is dealt face down. In this version, both of the dealer’s cards are also placed face down which is extremely unfavorable for the players. The best winning combination is called Pontoon instead of blackjack but it consists of the same cards – an Ace and a Ten. Besides the difference of the name of the highest winning hand, the payout for Pontoon is also not the same – 2/1 instead of the regular 3/2. The second best hand that can be formed is called Five Card Hand and it consists of five cards whose total is a maximum of 21. The house edge is the same as in European Blackjack – 0.39%. Blackjack is undoubtedly one of the most enthralling casino games of all time due to the fact that it has interesting rules and gameplay. Since it is one of the most played games all over the world, it is no wonder that it has a number of entertaining variations. Nowadays, players have the chance to enjoy some of the most popular versions in almost every brick and mortar casino as well as online. Thanks to this huge diversity, they can experience their favorite game in a new, more exciting way and have fun.